ABUJA BOMBING: A HOUSE OF CARDS | ItuaLive! 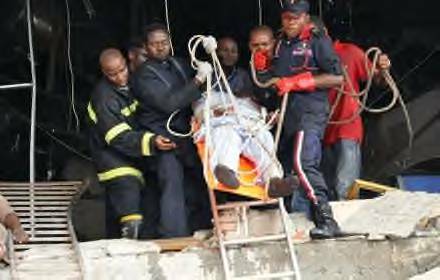 Yet again Nigeria’s national security was breached on Friday when a bomb was detonated in the nation’s federal capital Abuja. The United Nation (UN) building was the target and was reduced to rubble after a suicide bomber detonated a bomb leaving about 23 dead and several more seriously injured. This is the second major attack on the Nation’s Capital by the Islamist Militant Group, Boko Haram. This time around, they have not only chosen a different kind of target but have also amplified the magnitude and scale of the attacks. Without a doubt, this is a terrorist attack and has been condemned by several governments around the world. Boko Haram has grown from their “humble beginnings”- killing locals in Maiduguri and Bauchi- to invoking worldwide attention by unleashing mayhem characteristic of groups such as Al-Qaeda and Hezbollah. Their attacks have also grown in boldness, intensity and “finesse” which suggest exterior influence. Boko Haram also seemed to be more organized and better financed. They have hitherto attacked only Nigerian symbols of authority like the Police and the NYSC and have raised serious questions by their attack on the UN. Has the organization been taken over completely by outside forces and if so by what degree? Secondly, are they still implementing their agenda or is another organization using the Boko Haram structure to implement theirs? A statement credited to Boko Haram after the blast reads: “More attacks are on the way, and by the will of Allah we will have unfettered access to wherever we want to attack”, the spokesman, Abu Darda said by phone. “We have more than 100 men who are willing to lay down their lives for the cause of Allah”. (Source: Thisday live ). This statement is not characteristic of the Boko Haram we are used to, something doesn’t seem right here. My belief is that they have been infiltrated by a more organized group. The FG had the opportunity to stem this ugly tide some three –four years ago but mismanagement the situation as usual which has led to this. When I watched CNN and Aljazeera’s coverage of the bombing, I was beginning to wonder whether it was my country these guys were referring to. The fact that what we hear about in countries like Syria and Iraq have begun to manifest here is a sad thing. How we got from a relatively non violent country to a fertile ground for Islamic fundamentalism is a question to ponder. The Nigerian Government seems helpless. They issued a statement describing the blast as an attack on the global community. They are very quick to share the responsibility with the “global community”. What did we do when this was only a local problem? What steps did we take when the seed was still budding? Security forces paid lip service to the situation. Members of the House would institute an investigation of enquiry and call the Inspector General of Police for a jamboree in National Assembly Complex. The I.G would in turn talk tough: “we will fish them out, there is no hiding place, they will all face justice”, and afterwards it becomes business as usual until something worse happens. To be honest we do need all the help the global community can offer. Our security forces cannot adequately cope. They have been embarrassed time and time again and should be assisted to find out the perpetuators of evil. What worries me the most is the suicide bombing dimension this attacks have taken. A suicide bomber can be anyone. He can be anywhere and the thought of this is terrifying. Who are these 100 men the Boko Haram spokesman talks about? When were they recruited and who recruited them? These are the questions our security forces should concern themselves with. I do believe that Nigerians do not take their lives. We can be accused of many things but suicide bombing is hardly one of them. My strong conviction is that these suicide bombers are not Nigerians. There have been reports that al-Qaeda may have infiltrated Boko Haram and begun training Boko Haram members in Niger and Somalia. They have been wounded by the death of their leader Osama bin Laden and his deputy and with their finances closely monitored by the FBI it is becoming harder for them to carry out their activities so Boko Haram seems a fertile ground to plant their seed. Terrorism is not the easiest battle to fight. We are faced with a faceless enemy who does not have any regard for the rule of law or for human life. The Nigeria Police is also ill equipped to fight crime let alone terrorism of this scale. The quick fix extra judicial killing of Boko Haram leader, Mohammed Yusuf escalated the problem. The Police do not seem to have a database of all suspected Boko Haram members so it’s hard to see where they will begin their investigation? There are however some other ways to they could have tackled this problems. Why couldn’t the police deploy some of its members into Maiduguri to infiltrate the group and act as loyal members years ago? Success in anything does not come cheap. It would have been a risky venture but by now if the “under cover” police men were successful, we would know the master minds by now. Wouldn’t they have fingered the so called politicians who are behind the group? Common sense suggests that Boko Haram would have had the UN building under surveillance for at least a week. Some of them would have even entered for fictitious reasons to gather information on the security arrangements. Are we now saying that there are no security cameras in the UN building? Another suggestion on how this ugly tide can be stemmed is simple but very effective way of following the money. Bombs cost money. Facilities to train suicide bombers cost money. Everything cost money. So knowing the financial sources of these terrorists is extremely important. If there are Nigerians involved then it would be more difficult to trace because of the Ghana-Must-Go syndrome but at least the trail will end somewhere. The truth is that people are just mentally lazy and are just concerned about collecting salaries at the end of the month. It’s also worrisome that nobodies job is threatened because of these attacks. If not, we would have had a better way around this Boko Haram menace ages ago. Boko Haram’s activities have forced the government to its knees. And this is why the government considered negotiating with them. Terrorism isn’t a battle to be fought by setting up panels of enquiries or “fact finding missions” often embarked by the National Assembly. So long as no one has been tried and killed by the state for these crimes, our security forces will look impotent. Boko Haram will not take them seriously and will exhibit no restraints in their killing more innocent people. Nobody till today has heard anything about the Iranian diplomats accused of smuggling war heads into this country and we claim to be fighting terrorism. 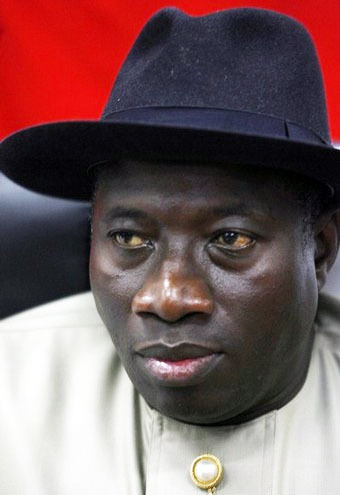 Goodluck Jonathan has become President at a trying time for Nigeria. The mere fact that he tinkered with the idea of negotiating with these murderers shows a lot about his character. He is sending out the wrong message. All anyone needs to do is cause disruption in law and other and you can cower the President into making decision. What Nigerians need now is truly decisive and sincere leadership. The president must realize that he was not appointed President but elected. He was elected by the people and it’s his responsibility to defend them. President Jonathan must act with some steel. He should spend a lot more on defense and intelligence gathering. He should desist from playing politics and meddling in affairs of the judiciary and tenure elongation and face issues that affect Nigerians directly. A public awareness campaign should also be built to make Nigerians more security conscious. We should become our brother’s keepers and look out for each other. Discipline among public servants must also be instilled especially in the police. The times where people with Jeeps and luxury cars are allowed to go freely on highways without security checks while other Nigerians are harassed must end. Those armored jeeps could be transporting bombs across the country. Security agents must begin to do their jobs wholeheartedly. We also do need help from the international community. I hear the FBI is coming to help out. This is a welcome development. The Nigerian Government must also address security issues with sincerity. The lies and politics government officials’ play is really alarming. For example, when there was a public outcry against Boko Haram after the Police Head Quarter bombing, we did not need detractors telling the President that amnesty was readily granted to Niger Delta Militants and so Boko Haram should be granted the same courtesy. Surely even the most circumspect President would be forced to tread more carefully. These politickings of national issues have made the President’s job a lot harder. Because the President tries to please all parties (especially the most powerful ones), he ends up doing nothing at all. When a sitting government begins to speak about negotiation with anti government parties that have obvious nihilistic agendas, then it’s obvious there is trouble. Imagine if the US government back in 2001 for a round table discussion with Osama bin Laden in 2001 to “uncover his grievance”. The President’s inaction is turning out to be more destructive as we are now left to the bloodshed unleashed of Boko Haram. This issue to me is by far the greatest challenge Nigeria has ever faced in her history. The Niger Delta crisis and Civil war is nothing compared to suicide bombing. One thing Jonathan should not do is to allow sentiments into this issue. He has a good heart and I believe he knows what is right for the country. Whoever is remotely connected to these crimes must be brought to book whether the person is highly placed or not. Too many jobbers and pen pushing sycophants are in government. They politicize, ethicize, and bring religion into everything to create disharmony. Boko Haram is the enemy and should be seen as such. Am emphasizing this because sentiments are the bane of the mediocrity we see in Nigeria. It’s the reason a mediocre is giving a job over a qualified person. It’s the reason people went about killing innocent people because the CPC lost election (by the way no one has been tried for those murders), it’s the same reason the Supreme Council for Sharia (a Muslim group) was backing Islamic banking not for its credence but because it begins with the word-Islamic.